As our readers know, I have never been a great baker, and my attempts in Lebanon were not exactly successful. Since then, my baking improved as I attempted it more and more and now I am capable of making decent desserts (insert proud face here). 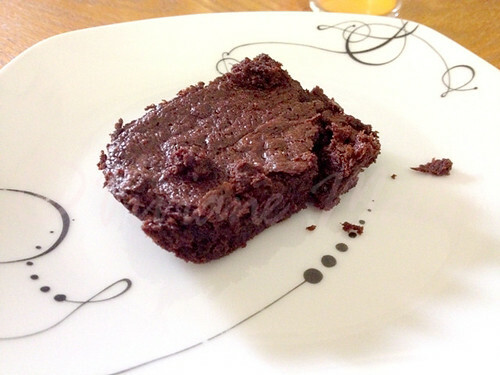 But brownies have never been quite like I wanted them to be till I found this recipe by Frugal Feeding. I have tried it over and over by now and it was a great success with everyone, so now it is a staple in our house. Although, I never made the gluten free version, I just used regular flour instead of almond powder, and I even tried a variation with oil (helps to have a chemist at home for such conversions). The recipe I am sharing on here today is my adapted version, with regular flour and coconut oil. I usually cut the amount of sugar in recipes, as we like less sweet desserts. The recipe initially calls for 130g of sugar I used 90g. It also calls for dark chocolate I used a combination of semi-sweet chocolate chips and unsweetened baking chocolate. The initial recipe called for raisins but I omitted them, you can use them or walnuts if you feel like it. Make sure to watch the brownies as they bake. Mine took about 22: 30 minutes at 325 F. I preheated the oven to a lower temperature by mistake. I recommend using a scale for this recipe as the measurements are in grams, I found it to be pretty accurate. 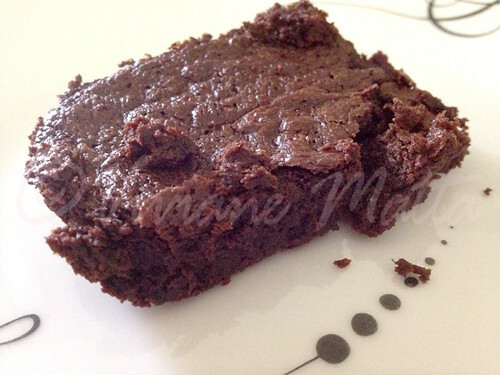 One last thing, I have to warn you that the brownies with coconut oil are extra gooey, but OH SO GOOD! 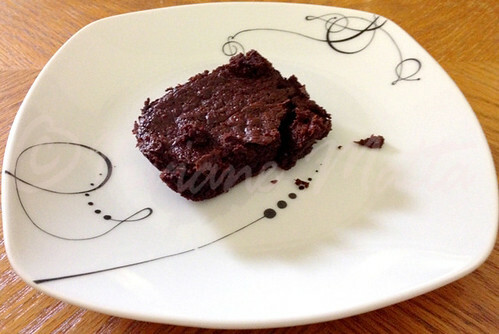 If you like your brownies cakey, this recipe is not for you, but if you are a fan of fudgy brownies these are your dream. They are rich and chocolaty. Begin by lining the sides of a suitably sized square pan. I used coconut oil and cocoa. Pre-heat the oven to 180C (~256F). Melt the chocolate in a large bowl in the microwave. Make sure to use a mid level power and go by increments of time. It took me 5 minutes in total, on power level 5. I started with 2 minutes then went by 2 increments of 1 minute. If you are not sure how it will work in your microwave go by increments of 30 seconds, so you do not scald the chocolate. Stir in the sugar. Beat in the eggs one at a time, until smooth. Tip in the cocoa powder, salt and flour and stir until as smooth as possible. 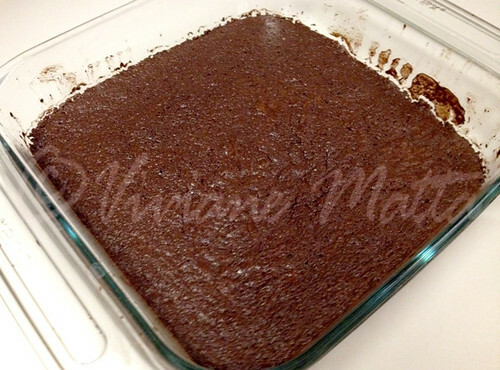 Bake for 15-25 minutes until the center of the brownies is just set. Leave to cool completely before slicing and eating. This entry was posted in Desserts & Sweets, Recipes and tagged Baking, Brownies, Chocolate, Chocolate Dessert, Coconut Oil, Dessert. Bookmark the permalink.